This morning in the quilt chat we were talking about scrappy quilts. I think Elaine's Swartz Creek Scrappy is a good example of controlled scrappy. Pepper Cory came to Chenango Piecemakers in 2006 and gave us a trunk show and classes. I chose to take the Swartz Creek Scrappy. It is a reproduction of an old quilt Pepper Cory found. Pepper walked around the room and rejected some fabrics we so proudly put out. At the time, I just didn't understand the concept of picking and choosing scraps to make a harmonious quilt. Eventually the idea got thru to me. In the past I just used whatever I grabbed. I love Elaine's quilt. The yellows and lime greens give it a little pop. 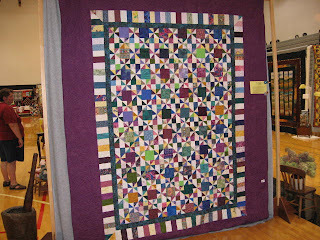 Elaine exhibited this quilt at our 2007 Chenango Piecemakers Show. In this quilt the lights appear to be nearly white. The quilt has a pinwheel, four patch and a square. Hmmmmmmmmm, maybe I'll get back to this one of these days. Meanwhile I need to finish the Nickel Brick quilt.